Even though Villa de Sales had been a successful large family farm for many years, Villa de Sales saw hard times financially after my grandparents passed away over 50 years ago. Most of the acreage was left to my aunts and uncles who later sold it to developers. The main house and 46 acres were left to my mother and two siblings, whom she later bought out. Mom did her best to keep things running, but its toll was an incredibly large burden. On top of this, my father was completely disabled by Parkinson’s Disease. So in 1996, I moved to Villa de Sales with the intention to make it work again. As an only child (and not a farmer), I not only needed to do something, but I greatly wanted to make this farm successful again. Another priority was to help my mother with the requirements of caring for her completely disabled husband. Honestly, I had very little help to start, and I have run this farm myself, doing all of the daily chores myself. In my opinion, you don’t “choose” to farm; it is a devotion. You don’t wake up one morning and say, “Wow, this is a great career opportunity. It is what you are!” And then hopefully, with a lot of work, you will find a way to make it work. Alpacas have helped me make this work! I started my alpaca farm with acreage and a very old home which needed tons of repairs. I had no fencing to begin with, but I did have an old tobacco barn which I could use as a shelter for the animals. I built my business and made the needed repairs to our home and structures ONLY from the alpaca farming business. I did not inherit a large sum of money to purchase alpacas. I was actually the first person in the state of Maryland to get a loan (from Colonial Farm Credit) for the purchase of alpacas. Alpacas and alpacas ONLY have enabled me to make this farm self-sustainable again. This makes Villa de Alpacas Farm at Villa de Sales very unique in the alpaca industry! Alpacas are my only business, and the money to do this came from alpacas. I did have some acreage and a few old building to start, but it was alpacas that got me to where I am today. Start your own alpaca business! Let me help you make your own dreams a reality with an alpaca business! 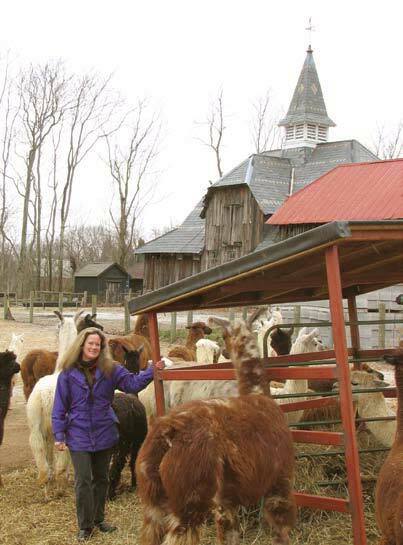 I will share with you not only every aspect of my alpaca husbandry and medical experience, but also all the aspects of my personal business plan, and most importantly, the tax advantages of owning alpacas and running an alpaca farm on your own property. In many ways, the tax benefits on owning these lovable and beautiful animals can give you significant financial advantages which are incredible and can be one of the very best reasons to own alpacas. You can gain these tax benefits just with a few animals. You do not need a large herd. In fact, I often recommend to new people to make alpacas a “supplemental” income as opposed to their main or only business, as the tax advantages are the same. And most importantly, this philosophy also enables you to enjoy your alpacas more with less cost. One thing is for certain, though, I promise to always do my best to help you in any way possible in regards to these wonderful animals—not only as pets, but as a successful and most enjoyable family business! To learn more about helping the family farm stay alive, please visit www.farmaid.org.